Appreciating a work of art with an aviation theme, by way of an inspiration for both art and aviation itself, can’t go without comment. I can recall coming across this image when I was very young. The emotions provoked by the work of this artist probably had a great effect on my choices concerning my career as both artist and aviator. Much like my reading the work of Ernest K. Gann when I was a young adult specifically, “Fate is the Hunter.” Ernie had also written “The High and The Mighty” which became a popular movie starring John Wayne in the early 1950’s. My appreciation below of the Frank Wootton painting is more of a critique on why, from my perspective, as an artist and an aviator it is such a fine work of art… in my humble opinion. “in-spire” verb: 1. To fill with noble or reverent emotion; exalt. 2. To stimulate to creativity or action. 3. To elicit or create in another. One cannot ask more of a work of art and its artist than to have the ability to incorporate the word definition of “inspired” onto a two dimensioned flat surface. It’s the definition taken from a standard dictionary. For me personally, a painting executed during the early stages of World War II by artist Frank Wootton fits this definition handsomely. 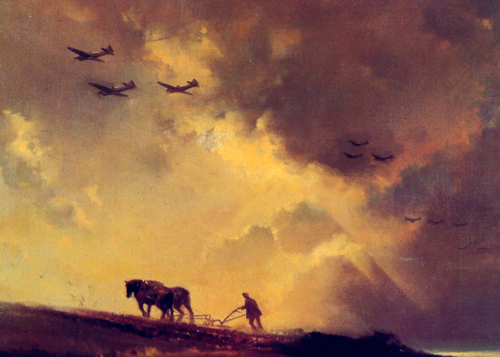 The painting’s title, “Defiants Enroute to Dunkirk,” says little about the power of this work. You would need to be at the scene in that moment to fully understand its relevance. This is after all I believe the duty of an artist. It has taken me a lifetime of flying experience and years of pursuing an art education to just qualify myself to reflect. What is it about this work of art, that I encountered at an early age, that continues to fill me with noble and/or reverent emotion? It was the vehicle that propelled me into my life’s work, as an aviator and artist. Thank you, Frank Wootton. The painting is certainly qualified as aviation art, but it is not about airplanes. It is about the toil of man, a historical moment in time on more than one front. But its secret, and the not so obvious power of the painting, is in its composition. As I see the elements of composition reflected in this painting, I can’t help but comment on some basics. When judging this work of art, what comes to mind are the Greek standard terms: idealization, refinement, and simplicity, accordingly all marks of beauty. These terms also reflect nicely on fine art standards: beauty for the sake of beauty … dictated by; one light source, the cushioning of values, repose, and its universal subject matter. He brought into focus the opposites in technology, two horse power pulling man through the earth with his primitive plow, while in the distance above several thousand horsepower pulling men through the skies. The artist has managed to marry two eras, with the never ending struggles of man. Yes, definitely original. 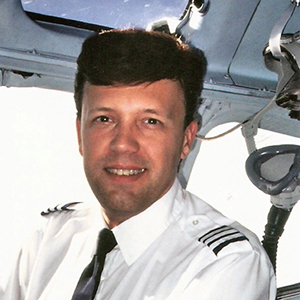 Craig Kodera has participated in the lure of aviation from boyhood, to private pilot, to Strategic Air Command pilot, to airline pilot. Aviation-the catalyst in shrinking our world-is also the career field of a relatively small number and it has become a truism that aviators compose a close-knit, though extended, family. Yet, it still comes as a bit of a serendipitous surprise that Ron Hart and Craig Kodera shared the same American Airlines’ cockpits. This said, it can’t be too much of a surprise that Craig’s uncle flew with the Doolittle Raiders. This is the “stuff ‘ that makes aviation the unique joy that it is. It is undeniably thrilling to “…slip the surly bonds of earth,” but it is equally stimulating to witness the extraordinary influence and impact that aviators make upon one another and each one of us in turn. This is the human element that adds so greatly to our love of flying. It was a gift. It has been on my studio wall for the better part of twenty years-as my secret inspiration. The painting “Fifty Years A Lady” measures eighteen by twenty-eight inches. 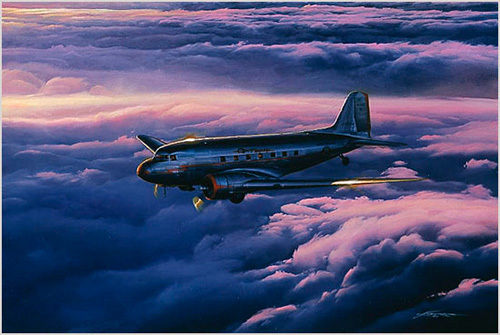 I say painting, but what I mean is that I have a print, a limited edition print of an American Airlines DC-3. The airplane is sitting right squarely in the middle of the canvas, portrait style, a tough task for any artist but this artist carries it off well because of the painting’s solid structure. Squint your eyes only slightly and you can clearly detect a cool quadrant in the lower left. The quadrant is surrounded by a warm L shape (the horizontal bands of alternating light and dark clouds) with creative use of soft edges-wonderfully done. Squint your eyes one more time and notice that the subject disappears. This is called, “the motif being transparent to its structure,” or rather the motif is part of the structure. It is a technique first used by the artist Rembrandt. We know his name well. The atmosphere created for this subject is perfect. American Airlines introduced the first “sleeper” category aircraft in the early days of air travel. The painting’s subject aircraft is back-lit with a low angle light source (a rising or setting sun… your choice) that creates a subtle high­ light on the top of the forward fuselage; the light continues catching the left wing tip. I can almost hear the passengers snoring and I’m still watching for a little reading light to become visible in one of the cabin windows. Because of the paintings great composition and the technique of the artist, this piece of art sings for me. It has been singing to me ever so softly from the wall in my studio while I pursue the task of trying to be an artist. I mentioned earlier that the print was a gift. It was a gift from my co-pilot of many years ago. That co-pilot’s name was Craig Kodera. Craig was a friend and also the well-known aviation artist who created, “Fifty Years A Lady.” With his gift, he kept me in touch with my roots and I want to thank him for sharing with me a fine piece of his art. A few years ago, shortly after I completed a painting with an aviation theme, I asked a friend of mine for a critique of the work. His response was to send me a book titled Aviation: “A History through Art.” Along with the book, he suggested I should get in touch with the ASAA. I asked, the AS… what? I had no clue. My friend and critic, a fellow aviator and artist that I’ve known for some years was none other than Craig Kodera, the renowned aviation artist I used to fly with. The book, (printed in 1992) is the first compilation of aviation art by the American Society of Aviation Artists, introduced me to a large cross section of artists that paint almost entirely aviation themes; most of their names were unfamiliar to me. When I first scanned the book, there was one painting that caught my eye, and I remembered spending some time over it. My first fascination about the work was from a pilot’s point of view. “Precarious” is the word that came to mind as I studied this work of art by Paul Rendel, which is aptly titled “Morning in the Rockies.” Critical, delicate, slippery, on thin ice, hanging on a thread, trembling in the balance, all these words and phrases contribute to my feeling about this painting. I believe I picked the right word! As a pilot, I have difficulty imagining being in the cockpit of the subject glider and having a warm and fuzzy feeling. First, I know how high he is and second, I know how cold he must be. If the pilot has a warm and fuzzy feeling, it is more than likely from a lack of oxygen. I also know something about the fragility of the aircraft, so I needn’t even mention the thought of turbulence to raise the hair on the back of my neck. Taking all of this into account, it is my humble opinion the artist Paul Rendel has managed to include all of the grueling suspense and wonder that makes aviation in itself so intriguing for those of us that love to fly and love to paint airplanes. Now about the painting; this is the most important part. Wow! A true serenade of opposing forces, alternating warms against cools, parallels holding diagonals, full light to full dark and all contribute to give the painting its depth. It holds together well. Every force expertly interlaced to bring the viewers eye back to the subject. One can’t ask for more in a piece of art. Well done! 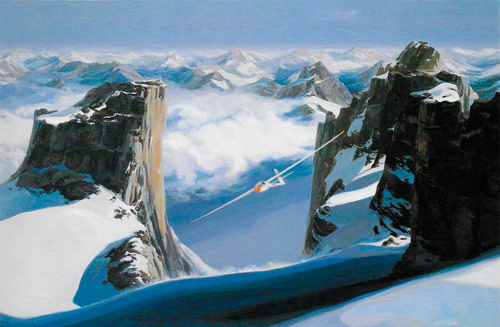 Did I mention that Paul Rendel, besides being a first rate aviation artist, is a first rate glider pilot? He is that. Let me explain. When I solicited Paul for his approval for my doing this appreciation on his painting, it was discovered that my former boss (chief pilot), Bill Holbrook, also taught Paul about flying gliders. It was just before I began my airline career many years ago… a lifetime. It is a small world after all and of special note, Paul and I grew up in the suburbs of Detroit, we are nearly the same age, and I refuse to admit at this point who is the oldest. Wow! Impressive! I especially like the painting by Paul Rendel, “Morning in the Rockies.” Great description/ analysis of the aviator artwork!